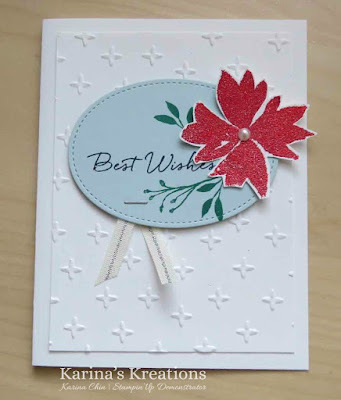 Karina's Kreations: Stampin'up Stitched Shapes Framelits Card! Stampin'up Stitched Shapes Framelits Card! 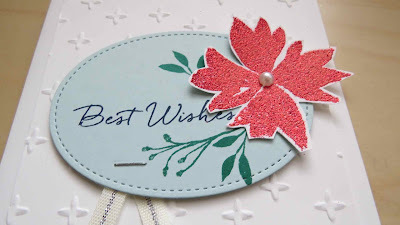 I made this cute card using the Stitched Shapes Framelits #145372 and Blooms and Wishes stamp set. The Blooms and Wishes stamp set #141784 is on sale for $19.50 until Nov 30. I stamped the flower image with Versamark ink and embossed it with the Real Red Glitter Stampin Emboss Powder #142635. The embossed background is made with the Sparkle embossing folder #141468. If you live in Canada and wish to place an order, click here!